Baker, F. 1913. 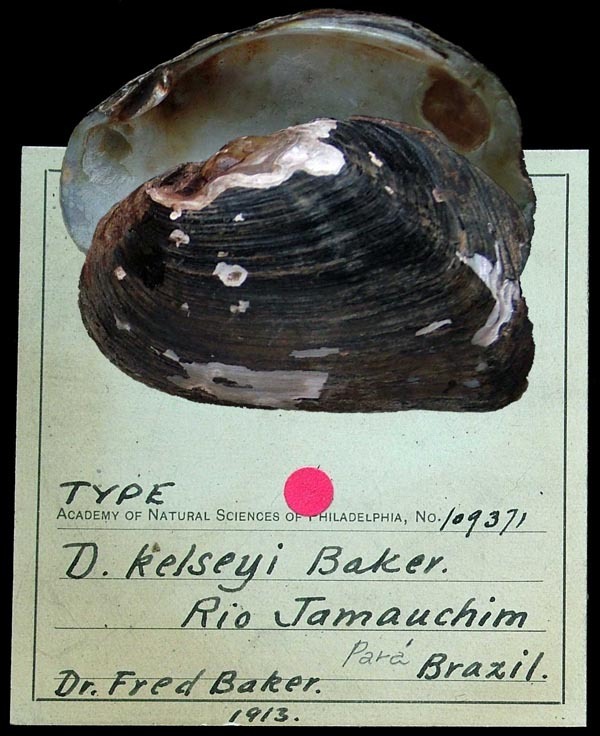 The land and fresh-water mollusks of the Stanford Expedition to Brazil. Proceedings of the Academy of Natural Sciences of Philadelphia 65: 618-672. 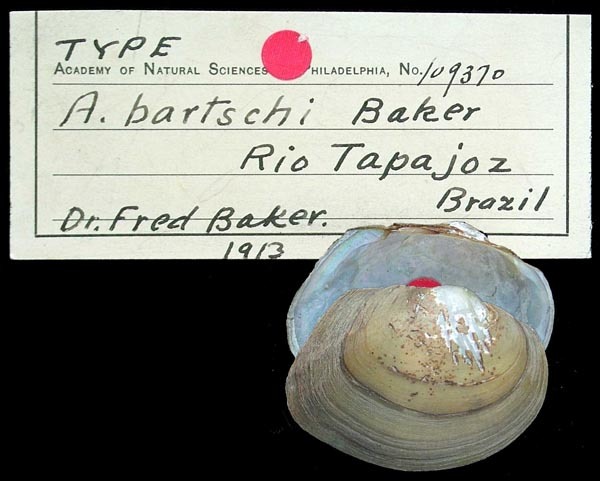 Anodontites bartschi F. Baker, 1913. F. Baker, 1913, Proc. Acad. Nat. Sci. : 668, pl. 27, figs. 3-4. Type(s): SYNTYPE ANSP_109370, Rio Tapajoz, Pinhel, Brazil. 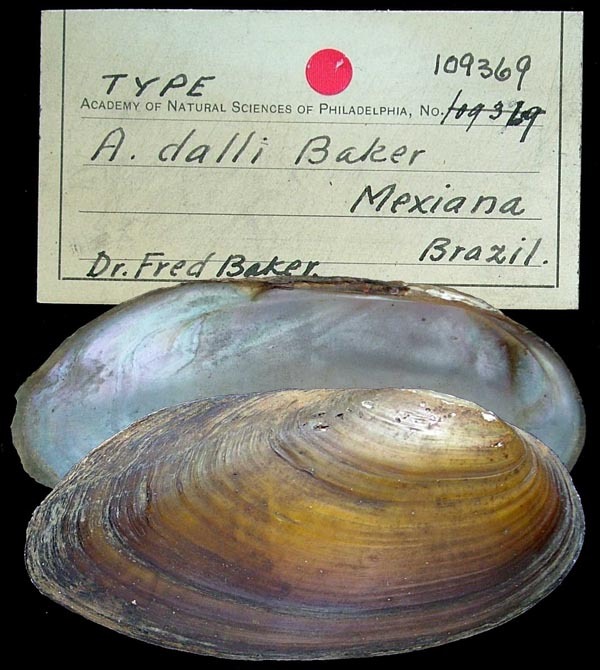 Anodontites dalli F. Baker, 1913. Diplodon kelseyi F. Baker, 1913. F. Baker, 1913, Proc. Acad. Nat. Sci. : 665, pl. 27, figs. 5-7. Type(s): SYNTYPE ANSP_109371, Rio Jamauchim, Pará, Brazil. Diplodon obsolescens F. Baker, 1913. F. Baker, 1913, Proc. Acad. Nat. Sci. : 666, pl. 22, figs. 16-17. Type(s): LECTOTYPE ANSP_109372, Rio Jamauchim, Brazil. 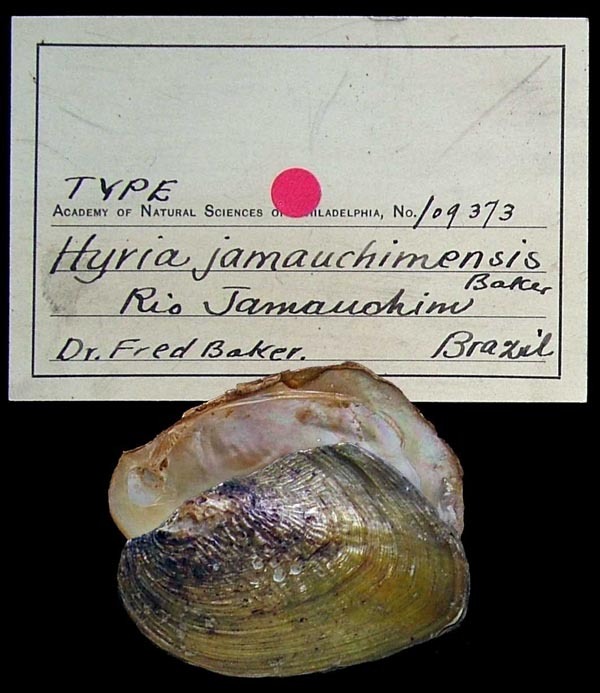 Hyria jamauchimensis F. Baker, 1913. F. Baker, 1913, Proc. Acad. Nat. Sci. : 664, pl. 27, fig. 8-9. 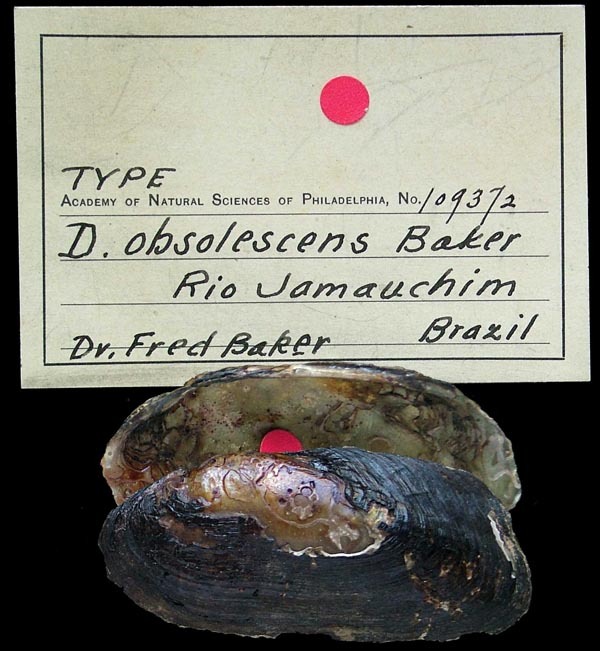 Type(s): HOLOTYPE (MONOTYPY) ANSP_109373, Rio Jamauchim, Brazil. Anodontites bartschi n. sp. — F. Baker (1913: 668). Anodontites dalli n. sp. — F. Baker (1913: 667). Anodontites ensiformis (Spix, 1827). — F. Baker (1913: 667). Anodontites trapezialis [sic] var. anserinus (Spix, 1827). — F. Baker (1913: 667). Castalia ambigua Lamarck, 1819. — F. Baker (1913: 664). Castalia quadrilatera Orbigny, 1835. — F. Baker (1913: 664). Diplodon kelseyi n. sp. — F. Baker (1913: 665). Diplodon obsolescens n. sp. — F. Baker (1913: 665). Hyria corrugata var. exasperata Sowerby, 1869. — F. Baker (1913: 664). Hyria jamauchimensis n. sp. — F. Baker (1913: 664). Prisodon obliquus Schumacher, 1817. — F. Baker (1913: 665). Prisodon syrmatophora (Meuschen in Gronovius, 1781). — F. Baker (1913: 665).